We didn’t call it a conference, because it wasn’t a conference. We called it a gathering. We called it a conversation. It was Rise Up, Sister 2017. 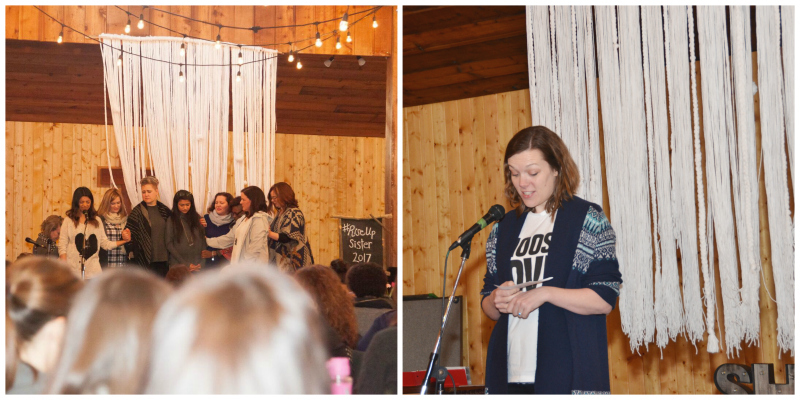 When about 100 women walked through the doors of the tabernacle at Camp Charis on a Thursday night at the end of February, it was the fulfillment of a dream. Words had truly become flesh. I feel a little Mama Bear—rather protective—over what happened between us from Thursday night through Sunday morning. We saw women become transformed before our eyes. So many who were hungry and tired becoming filled with hope and strength again. We ALL filled up on Love and belonging. It felt like we had gathered on the edges and we discovered just how much Life was there. One participant said, “Out there, it feels like we are the lone zebras in a herd of horses. 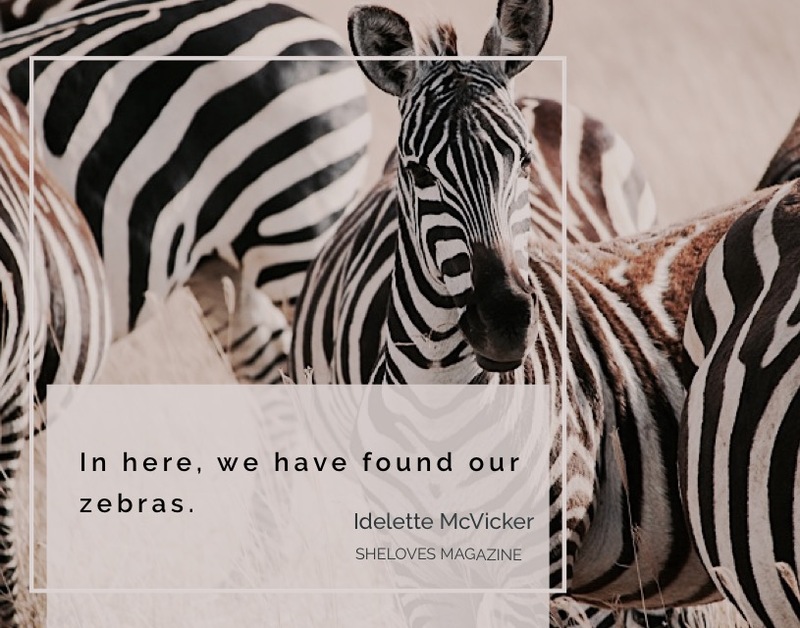 In here, we have found our zebras.” When she said that, the room erupted. We’d discovered just how good it is to be together. Truly. As you can imagine, over the course of nearly four days, there were so many profound moments. I’ll mention a few that stood out for me on a personal level. 1. The whole team sets the table. The first time I walked into the tabernacle, all set up, ready for the women to come, I teared up. It was so beautiful. I saw the vision Shaley had for that room come to life. I saw the Love and care it took to bring all the details together. I saw all the hard work—of ALL the volunteers—and in that moment, the Beauty of it all was astounding. 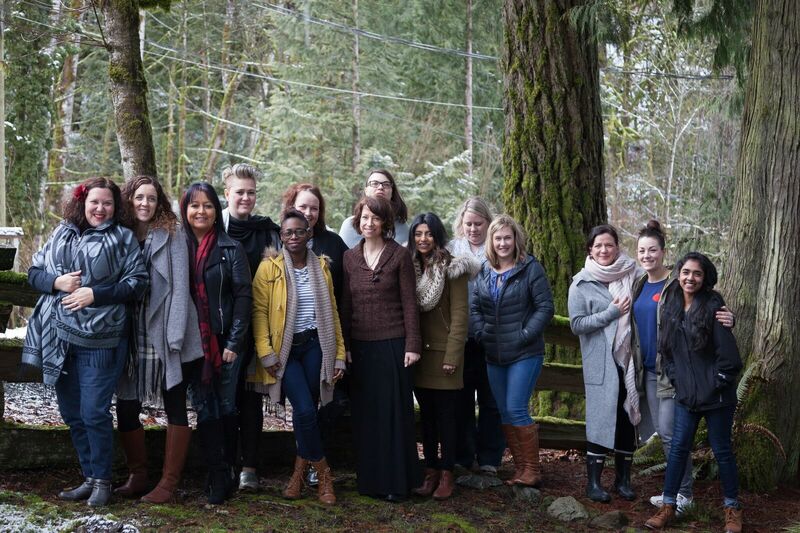 Rose, Shaley, Chervelle, Courtney, Kathleen, Daniela, Melaney, Tina, Kelley, Kallie, Sarah. All of the women who worked to make this weekend happen. That was a moment. 2. Internet friendships are the real thing. At 4pm, Rose was ready at the registration table. We had spent hours that week working through the room lists, praying and trusting that the Spirit would be at work through our human decisions. Then the women started arriving … the little reception area at Camp Charis began to fill with shoes and women’s voices and slightly hesitant conversations. Then Holly Grantham walked in. Here was a woman who had joined our editorial team from the very beginning. She had been a part of our editorial team for over three years. We had only ever connected over the Internet. We had prayed together, we had cried together, she’s edited my stories and challenged me and I have read her words and her heart for years. Suddenly, she was right there and when we hugged, the Internet became flesh and the tears streamed down my face. Rose had made it possible for her to come and I am so grateful, because it was one of the most profound experiences, standing in Holly’s presence, loving her as a friend already for many years, but only getting to meet her in real life then. That was a moment. 3. My world can come together. 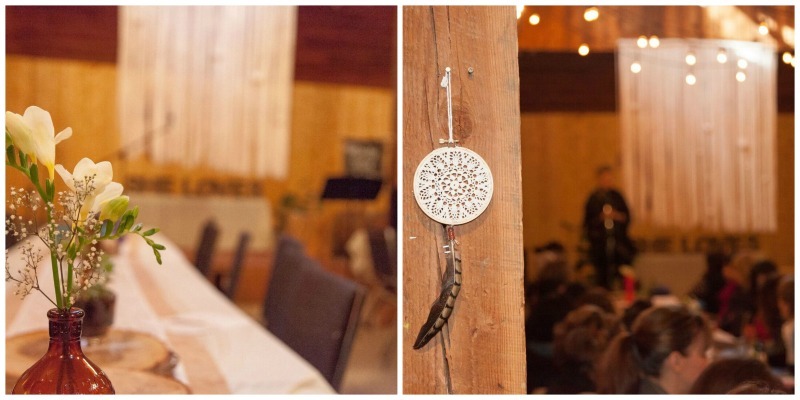 At Rise Up, Sister, was the first time my world came together in a very real and tangible way. As a daughter of Apartheid, I have often grieved this separateness of the many, many segments of my life. When my online world and my mothering world and my restaurant-husband’s world don’t connect. But this time, teachers from my children’s school came. Sharlene who is a manager at Milltown Bar + Grill came. Women from my church came. Women from Vancouver came. 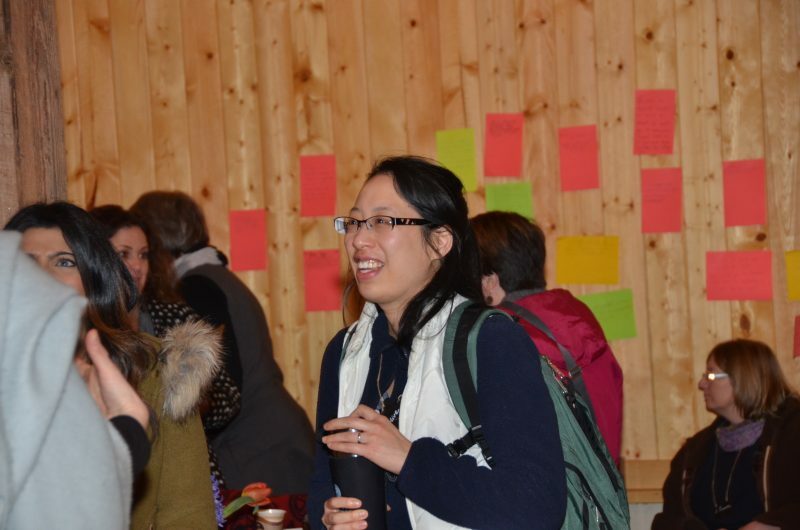 Women from Chilliwack came. Women from Texas came. Women from California and Idaho and New Jersey came. Fiona and Stephanie from England came! Sandy Hay came. Our editorial team came. My world felt so beautifully connected and it was scary and overwhelming and so, so beautiful. To have so many women who make an impact on my life in the many areas of my life all in one place? It was and is still so healing. That is a moment. 4. She’s got the whole world in her hands. 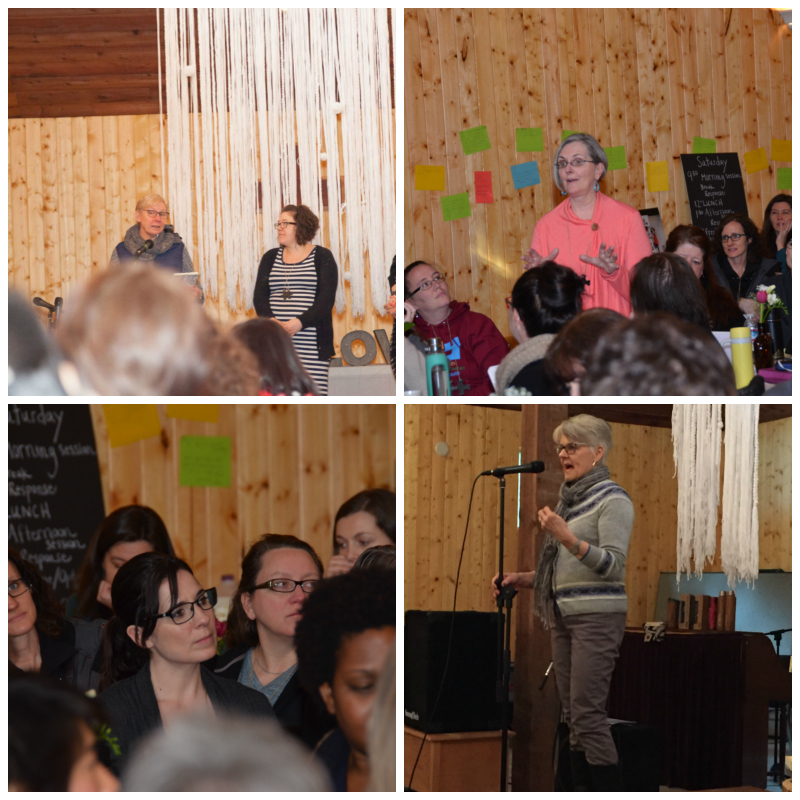 One of the elements of our gathering, was that women in the room had a chance to share some of their stories—of where they are in their lives and what God is doing in their hearts, in this season. We didn’t give them time to prepare, but throughout the weekend either Kelley or I would quietly go up to a woman and ask her if she would be willing to share during an upcoming session. Sherrine Francis went first and she cracked us all open with her honesty, her vulnerability and her storytelling. Woman after woman astounded me with how they held the space and told their stories bravely. 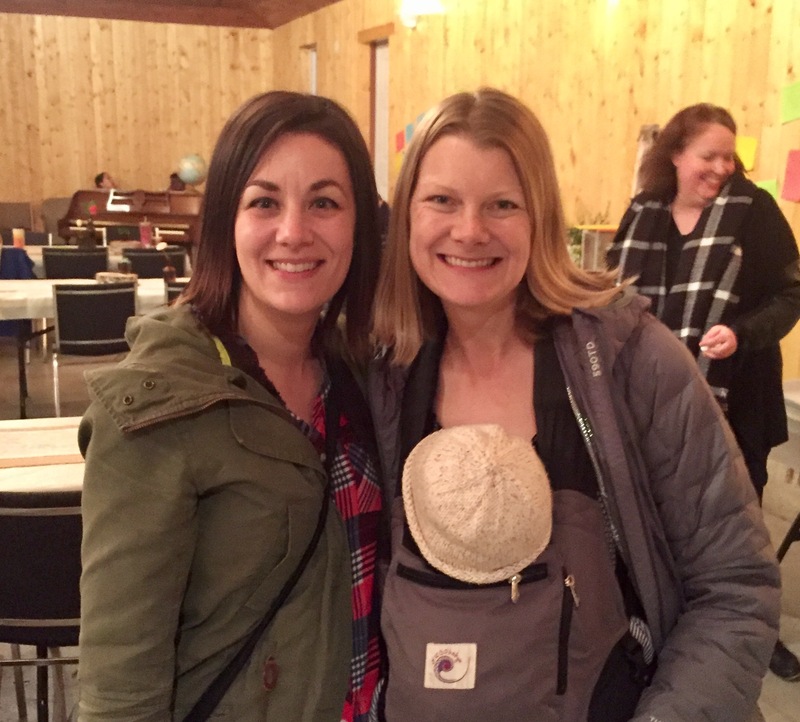 When Fiona Koefoed-Jespersen came up, she told us about the season she is in with raising young children and wanting them to have a more expansive understanding of God. 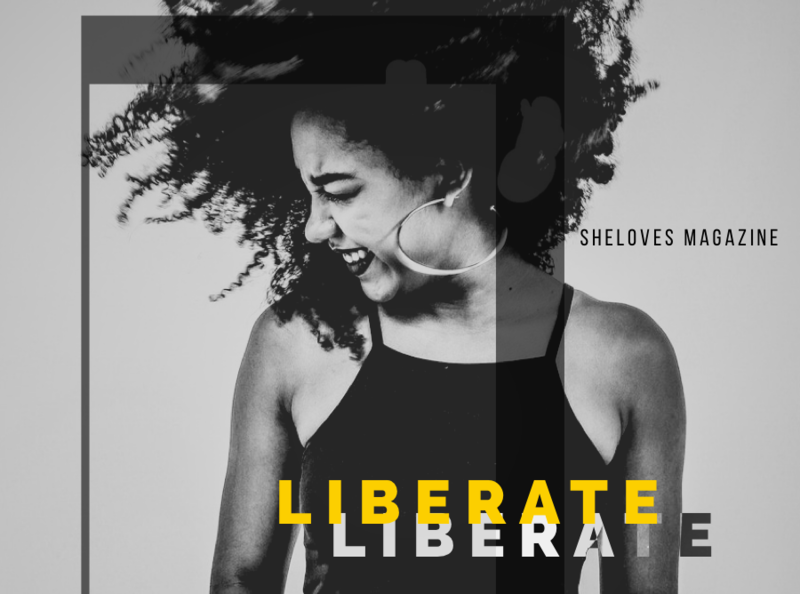 As she was broadening her own understanding, which included embracing the feminine face of God, she’d started incorporating some feminine pronouns into the songs she was teaching her children. Then she stood there on the little stage and she began to sing, “She’s got the whole world in her hands …” We knew we were witness to something so sacred. She had allowed us into her journey and some of her freedom and right then, it was freeing us. As we sang with Fiona, the room felt held by this song … It felt so tender. God watching us and holding us, loving us, like a Mother. That was a moment. 5. The more we step up, the more we have an opportunity to expand. We had asked Melaney Lyall to open our gathering on Thursday night. 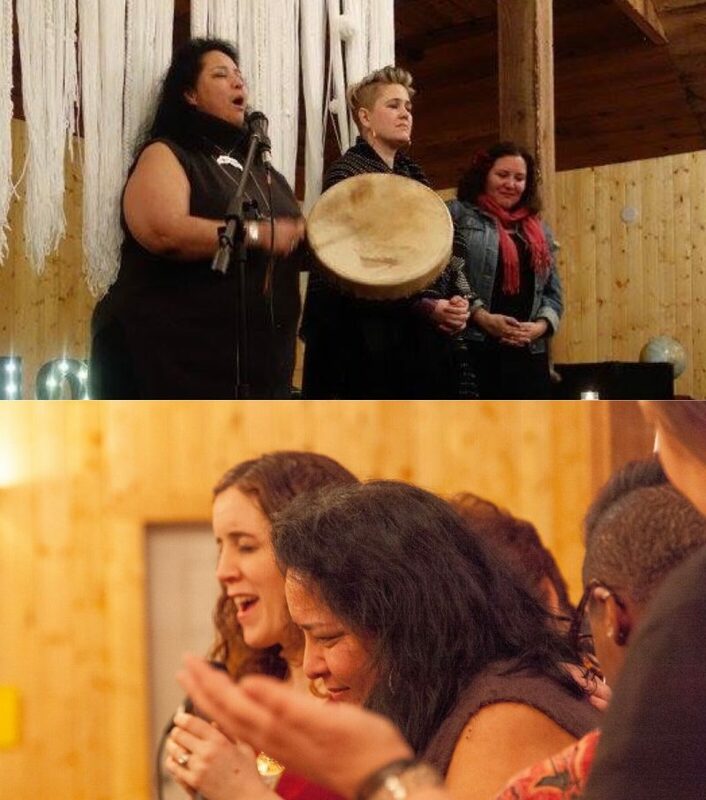 She beat her drum and sang an indigenous song, reminding us of the territory we were standing on, praying for us and with us and, as she was doing that, I felt such a profound sense that we were finally doing something so right. That this is how we are meant to start all our gatherings and meetings. That our indigenous friends need to go first and have an honored seat at every table. That was a moment, yes, but it was even more profound for me, towards the end of the weekend, when Melaney sang again … In that moment, I saw how my friend was rising. How she was taking her place and rising as a mother in our nation. I saw how her voice had become fuller over the weekend. With her first song, she had invited us. When she sang again, she was holding us. She was enveloping us all in Love. To see a friend expand in her voice and her place, for me, that was a moment. 6. From one red couch to many, many couches. This is what Love does. On Saturday afternoon, we had a gathering with our editorial team and regular contributors. We sat in a room and filled up many couches and chairs and it astounded me how we had grown. SheLoves was a dream that God had planted in my heart so many many years ago. In that moment, I saw the faithfulness of God. I saw how God is so much larger and so much more beautiful than I could ever grasp, hope or imagine. That was a moment. 7. One woman rising in her gift, is every woman rising in her gift. Before breakfast, every morning, we held a space for Lectio Divina where we could come together, read God’s Word, be together in silence, listen together and pray together. Olive Chan led us and sitting in that circle with her, was one of those moments when you see one of your women rise and be so fully who God had created her to be. If I could hope for one thing, it would be to see every woman in my world rise into her gifts like I witnessed Olive rise in the morning. That was a moment. 8. We are hungry for ceremony and honor. And then there was Sunday morning. After Kelley preached her socks off again, we had communion. 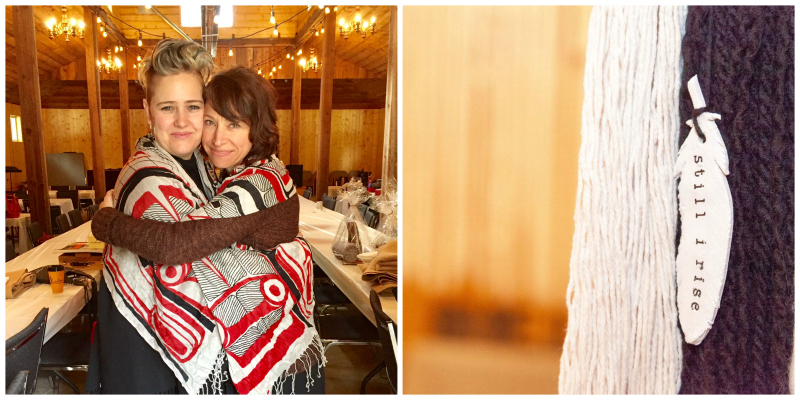 Kelley and I served the bread and the wine … then each woman received a scarf from either Melaney or Kallie. Honor filled that space. 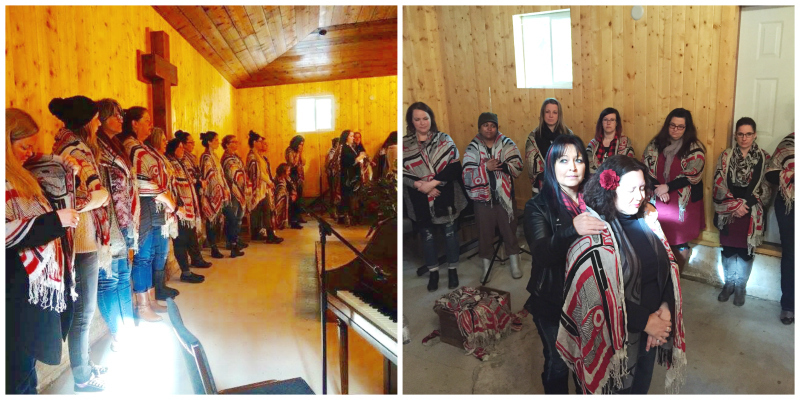 Each woman was acknowledged and prayed for and draped in the same beautiful scarf. We had listened to stories of pain, we had listened to stories of injustice, we had listened to the fire of freedom that God is stoking in each of our hearts. 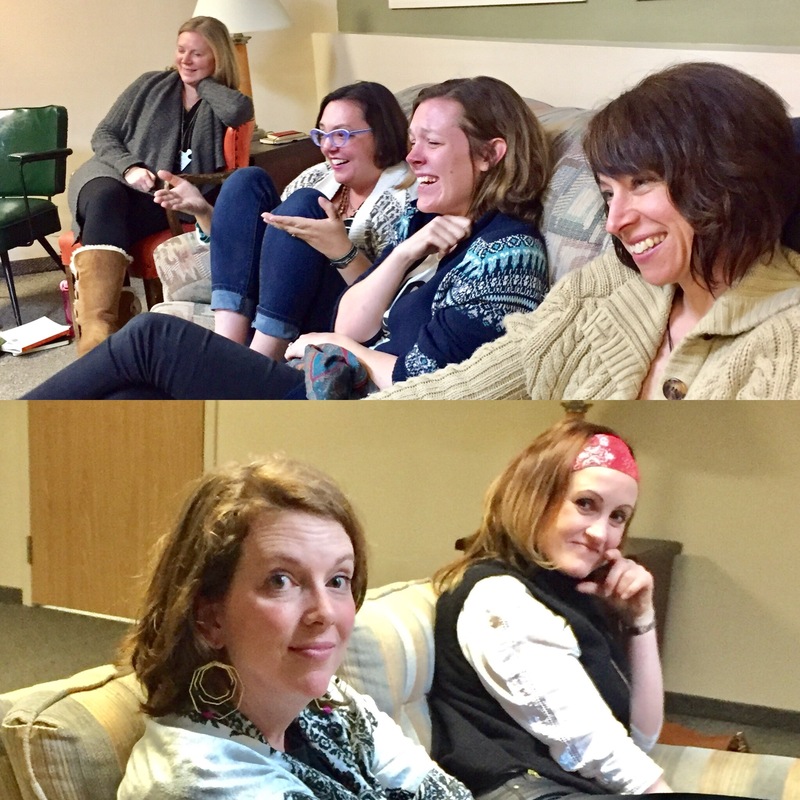 When Kallie and Melaney draped us in the scarves, we became witnesses … to the goodness of God, to each other’s stories, to the work that needs to be done. We became witnesses to the gifts and the strengths we see in each other and to the Love that needs to be spread out into the world. It was a prayerful moment. I remember, at one point, looking up and gasping, because we were all forming a circle and with each woman, draped in the same scarf, we looked like unity. We had become part of the cloud of witnesses. Ceremony and honor did that. That was a moment. 9. When we are Women Who Love, miracles can happen. A few days after the event, we received an email from one of our participants. 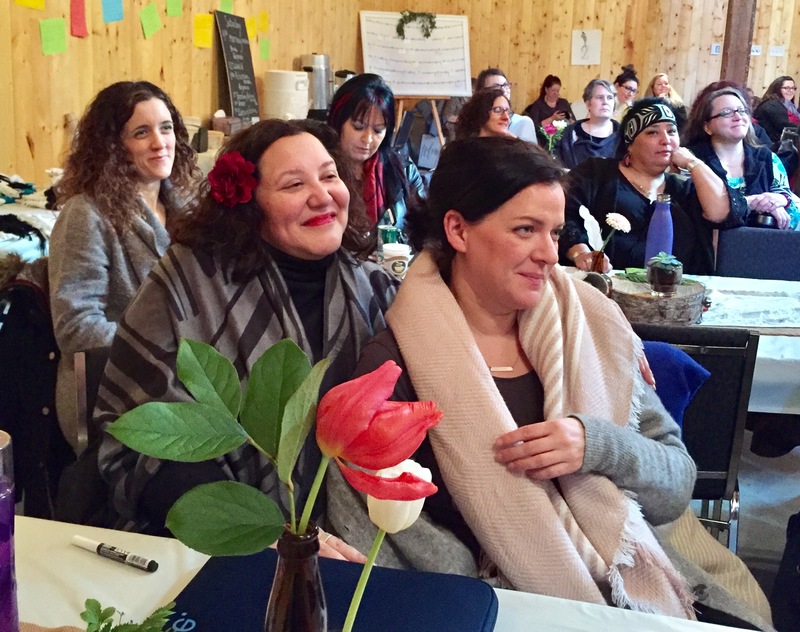 We had heard stories of women being profoundly impacted and in many cases, we were all witnessing it as the days went by … transformation was happening in front of our eyes! But this email sealed it. She wrote to tell our team that this weekend showed her there are still women she can trust. There are women who are not out to hurt her or wound her. She had learned that God had not abandoned her in her pain, but had been with her and had suffered WITH her. Her email showed me that a whole room full of women can be Women Who Love. We can live into this hope and vision together and when we do, miracles happen. We understood the weight of what she was communicating. We could so easily have messed it up, but by the grace of God, we didn’t. That was a moment. 10. Zebras need to unite. Even before Rise Up, Sister, we had started a private facebook group, so women could enlist help with rides and get to know each other a bit ahead of time. Now this group is buzzing. It reminds me how much we need spaces for belonging—safe spaces and brave spaces where we grow strong together, so we can do what we are called to do in this world. In here, I know and we remember: we have found our zebras. [ANNOUNCEMENT] WANT TO FIND YOUR ZEBRAS? It’s been a little over a month after Rise Up, Sister and we imagine there are more women who need to find their zebras. It dawned on me this year that it had been 21 years since I met Dorothea Rae at an International Women’s Day event in Taipei. That day she invited me to the first ever Women’s Power Breakfast and showing up at that breakfast, changed my life. I found Jesus in a fresh way in that circle of women. Then, seven years later, Gabi was conceived and I started on my journey of becoming a mother. Seven years later, SheLoves was birthed. And now it is again seven years later. I understood in that moment that something else was ready to be birthed. It is something we have been praying and longing for. Next month, on May 1, we will launch the Dangerous Women Tribe. This will be a paid membership element to SheLoves. It will be an online space where we can go deeper with God and each other, a place where we can find our people, find our voices and grow stronger together. The SheLoves you know and love will continue as it is, but for those who want to go deeper with us, we will create a new space. It will cost $12 a month with access to a private facebook group, a bi-weekly newsletter from my heart, live prayer times and an interview with a Dangerous Woman every month. We will have scholarships available and we are also committed to giving 10% of that fee to a cause close to our heart every month. So, watch this space and if this is something you are longing for in your life, be sure to join us here on May 1 for the big launch. It’s time to find all our zebras. PS: O, how I love our zebras. What were some of YOUR favourite moments from Rise Up, Sister? Where have you found community in recent years? 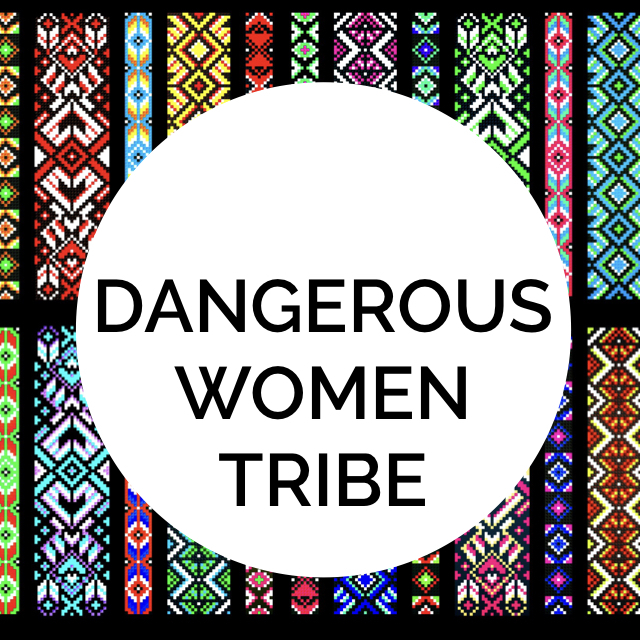 What would you like to see as part of a Dangerous Women Tribe? Thank you, Cammy Jones and Melaney Lyall (ok, spot my iPhone shots in there too) for providing us with images from our weekend together.